The owner of this blog is Jean’s daughter Patricia; she and her sister Janice have compiled and written this story of their mother. See also ‘Jean Marjorie ACTON Condolences’ posted September 16, 2013. If you would like to send a message to the family, or have memories or stories of Jean you’d like to share, please LEAVE A COMMENT or click here to use the email address theirownstories@gmail.com. Please keep checking this space, other photos and stories will be added – there is NO deadline. This post last updated April 20, 2014. 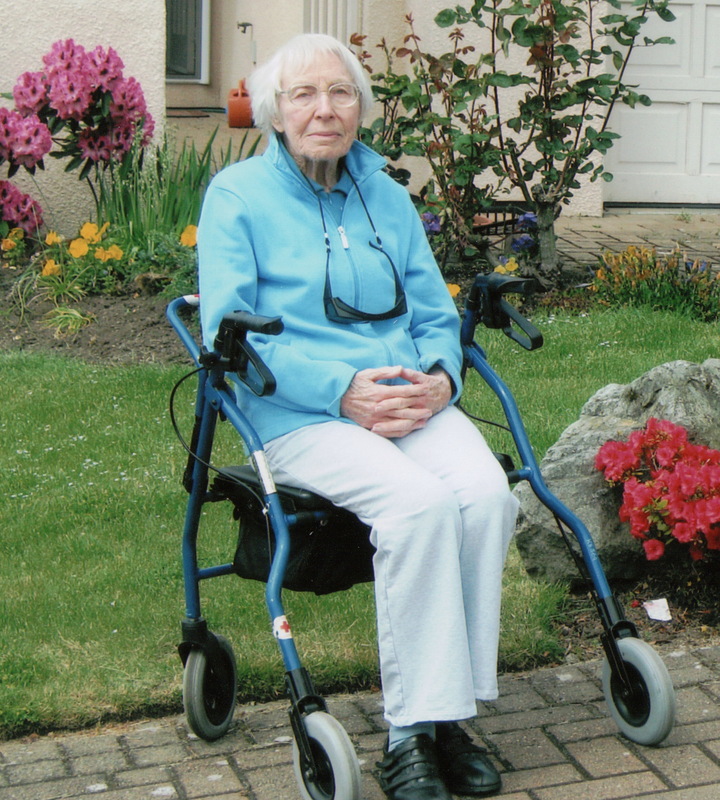 Jean Marjorie ACTON (May 16, 1916 – September 9, 2013) nee BOYCE, 97 years old, passed away quietly in Victoria, British Columbia. Much beloved mother, great/grandmother, sister, aunt, friend, and soul-mate, Jean’s vibrancy, empathy and inner strength were an inspiration to many. 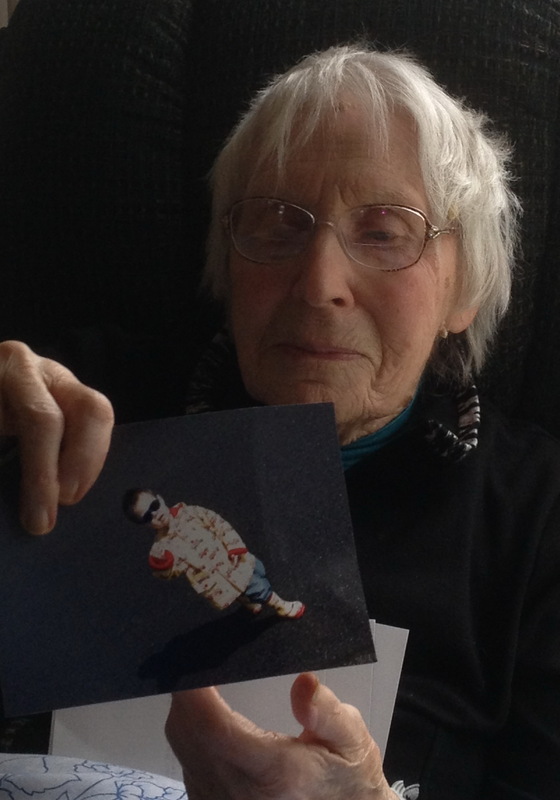 Left: photo of Jean taken July 2013, holding a favourite photo of one of her great-grandsons. Jean’s happiest times were with family and she will be deeply missed by her daughters Patricia (Jack Moffat) and Janice (Claudette Legault); grandson Daniel Acton Schick (Angie Hsieh); step-grandchildren Fiona Brown Moffat and Andrew Thomas Moffat; great-grandsons Thomas James Schick and Samuel Hunter Schick; step-great-granddaughter Brianna Emily Novak; brother Murray Simpson Boyce; sister Frances Ann Olynyk; and many other family and friends. Jean was predeceased by her husband Thomas Watson Acton (1991) and sister Betty May Campbell. Sunday, September 22, in Victoria, British Columbia, there was an Open House to Celebrate Jean’s Life. Saturday, September 28 Jean’s ashes were interred at a small private gathering at the Ellisboro Cemetery, Ellisboro, Saskatchewan. This was followed by a reception at the Seniors’ Centre in Lemberg, Saskatchewan. By Jean’s request, in lieu of flowers, donations may be sent to the University of Saskatchewan to the ‘The Tom and Jean Acton Bursary’. A word about ‘The Tom and Jean Acton Bursary’: This is a bursary totally run and administered by the University of Saskatchewan. Check out https://agbio.usask.ca/students/undergraduate/scholarship-and-awards.php and scroll down to the ‘T’s” for the ‘Tom and Jean Acton Bursary’. All monies received by the University are maintained in a trust fund and managed by the University. How did it start? The impetus to set up the bursary grew out of Tom’s and Jean’s own personal experiences (as mature students) and financial worries of going to university at the same time as raising a family and struggling to make ends meet, combined with their profound commitment to the value of education. 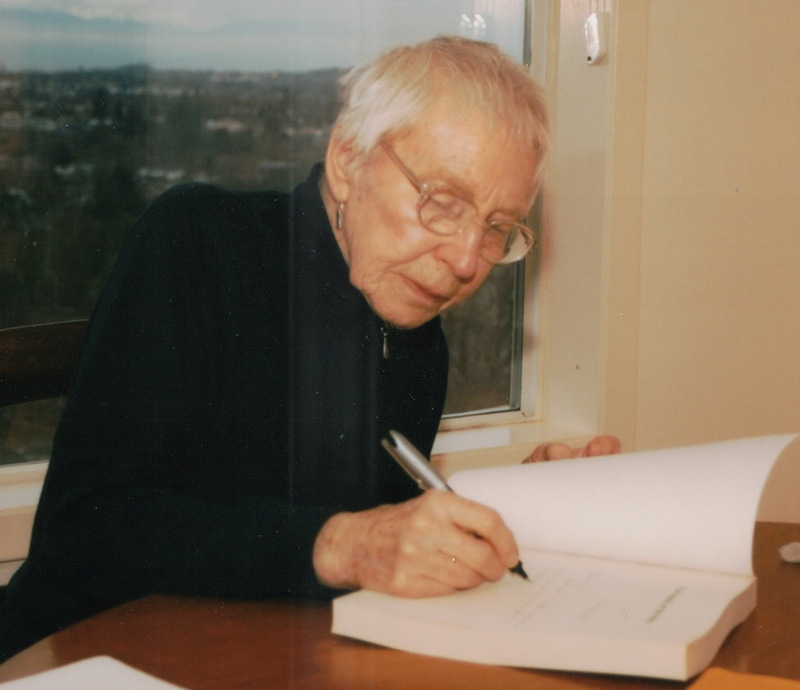 Following Tom’s death in 1991, Jean set up ‘The Tom and Jean Acton Bursary’ at the University of Saskatchewan in Saskatoon to assist mature students entering or returning to university. How does it work? The administration of the bursary is carried out by the University of Saskatchewan; the selection of candidates is based on financial need. Each year a bursary (currently $1500 per year) is provided to a student who began university studies at least two years after achieving complete secondary level standing, or is returning to university after an absence of two years. Candidates must be Saskatchewan residents and be registered in any year of the Bachelor of Science in Nursing (to recognize Jean’s interest) or Bachelor of Science in Agriculture (to recognize Tom’s interest) Programs. The bursary is awarded on alternate years to each Program; a nursing student one year, an agriculture student the following year. Please make the cheque payable to the University of Saskatchewan, but stipulate ‘Tom and Jean Acton Bursary’ or the donation will be added to the general University revenue. Address: University Advancement, University of Saskatchewan, 501 – 121 Research Drive, Saskatoon, Saskatchewan, Canada, S7N 1K2. A tax receipt which may be used for income tax deductions for charitable donations will be issued by the University in the name of the individual making the donation. Jean was born on May 16, 1916 in a Canadian Pacific Railway (CPR) station in Neudorf, Saskatchewan. She was the first of the four children of Susan Matilda DODDS and Roy Elmore BOYCE. Her father was the station agent in Neudorf, and growing up in a railway station was an interesting place to watch the world go by. 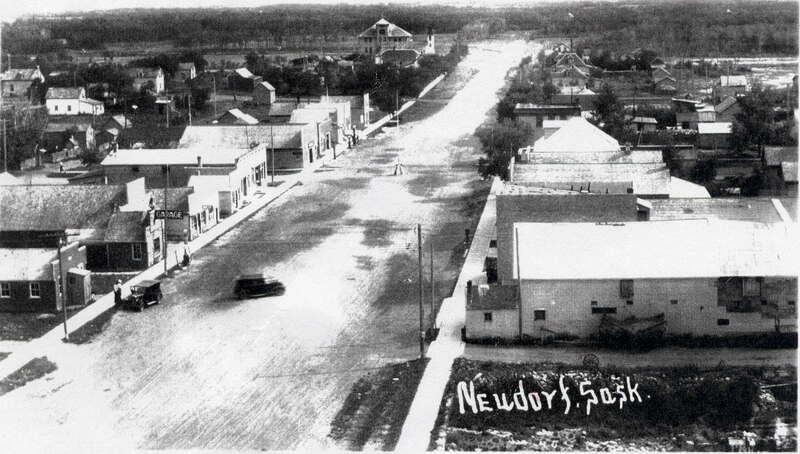 Neudorf was incorporated as a village only 11 years before Jean’s birth; growing up here offered many pioneering experiences. Below: Other siblings were Murray (born 1918), Betty (born 1921) and Frances (born 1923). From 1916-1934 Jean grew up in Neudorf and completed Public and High School there. She attained an Intermediate Music (Piano) Certificate from Toronto Conservatory of Music. Jean’s zest for life, broad interests, fun and creativity were shaped in part by growing up in a close-knit and loving family. In her early years she enjoyed a wide network of friendships and close relationships with a supportive extended family, including siblings and cousins, aunts and uncles. Her life-long love of music, reading and walking were rooted in her childhood, as was her strength and determination, and her get-on-with-it practicality, when facing challenges and adversity. Photos below: growing up in Neudorf. Photo with flowers: Graduation from high school? Below: Jean and friends, Jean in photo back left. 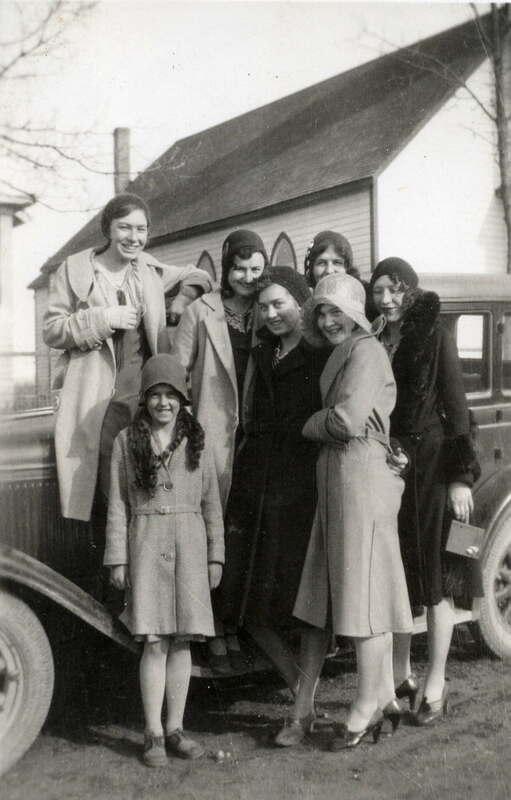 In 1933-1934 Jean, 17 years old, was in Moose Jaw, Saskatchewan, where she attended Moose Jaw Teacher Training School. Her dream was to become a nurse, however age requirements stipulated that women had to be 18 to be eligible for enrollment. Jean’s decision was to teach and earn much needed money for her nurses’ training. At the Moose Jaw Teacher Training School she initially received her Temporary Teaching Certificate; later she qualified for a Permanent Teaching Certificate. Photo below: Jean in Moose Jaw, obviously school was not all work! 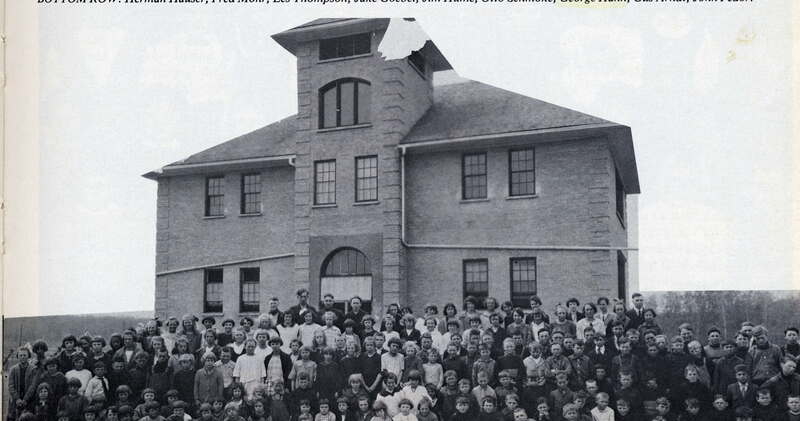 Between 1934 and 1937 Jean taught school at Rosewood School District #201, south of Lemberg, Saskatchewan. There she met her future husband Thomas Watson ACTON. Photo left: Jean’s first day of teaching at Rosewood School. Photo below: Jean with Tom Acton, a local farm lad, who became her husband. Rosewood was a one-room country school and Jean faced the challenges common to that type of education: a Depression era salary (minimal – if paid at all); one room with children ranging in age from 6 to 16 (in winter) and grades 1 to 12; uncooperative furnaces; no indoor plumbing, unsupportive superintendents and almost total lack of school supplies. However, with her indominable spirit she prevailed, became lifelong friends with the neighbours she boarded with and thoroughly enjoyed the rural social life of card parties, picnics (with home made ice-cream) and dances. In the later years of her life, students from this period of her teaching career would often fondly remember their teacher ‘Miss Boyce’. 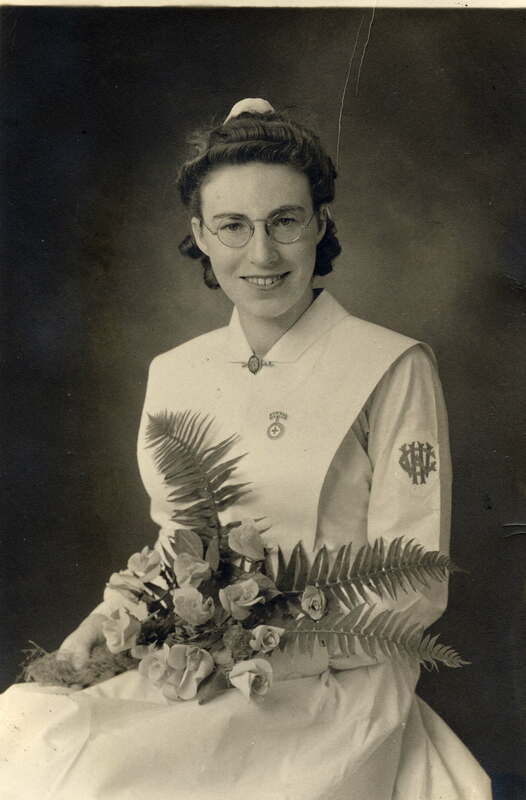 Her teaching job at Rosewood finished at the end of 1937, however she had to wait until March 1938 Intake Class to get into the Registered Nursing Program at Winnipeg General Hospital. To earn additional income and fill in the time, she spent January and February 1938 substitute teaching at Viewland School, south of Grenfell, Saskatchewan where, even in the brief time she was there, she made life long friends. Jean’s teaching career was only to fill in time (and earn much needed money) until she was old enough to be accepted into nurses’ training. In March 1938 she fulfilled this dream and started courses at Winnipeg General Hospital. She graduated in April 1941 with her Registered Nurses Diploma. 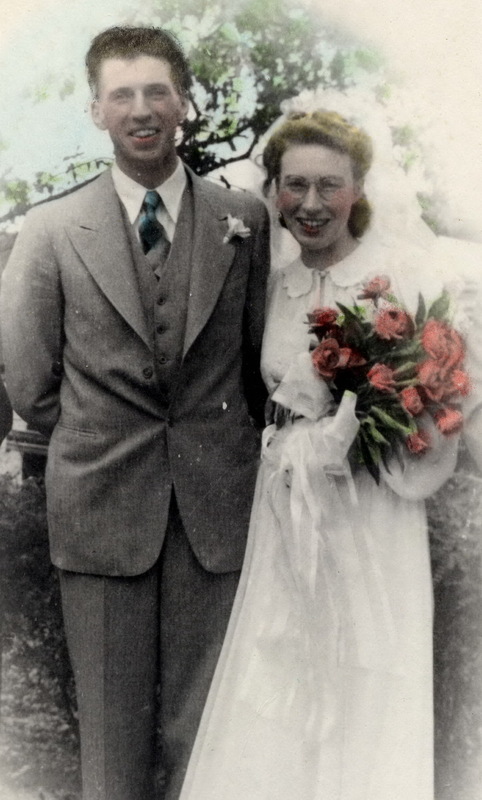 Jean married Tom on June 28, 1941 at the Neudorf United Church. Her wedding dress was the dress she had worn for her nurses’ graduation, lunch was served at home in the Neudorf CPR railway station and pictures taken on the station lawn. 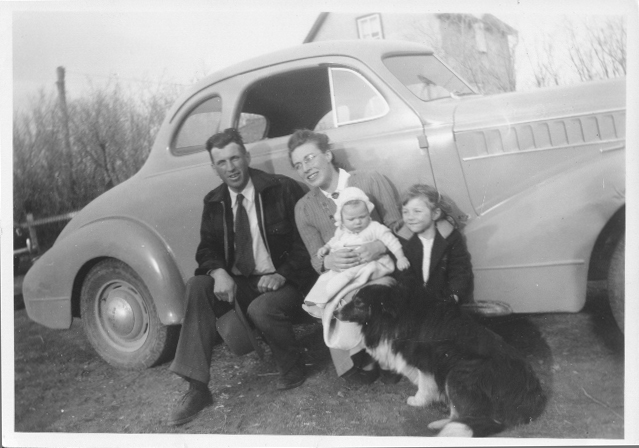 Tom sold the old car he owned to a friend so that he would have enough money to get married; then he borrowed the car back for their one-day honeymoon to Ft. Qu’Appelle, Saskatchewan. 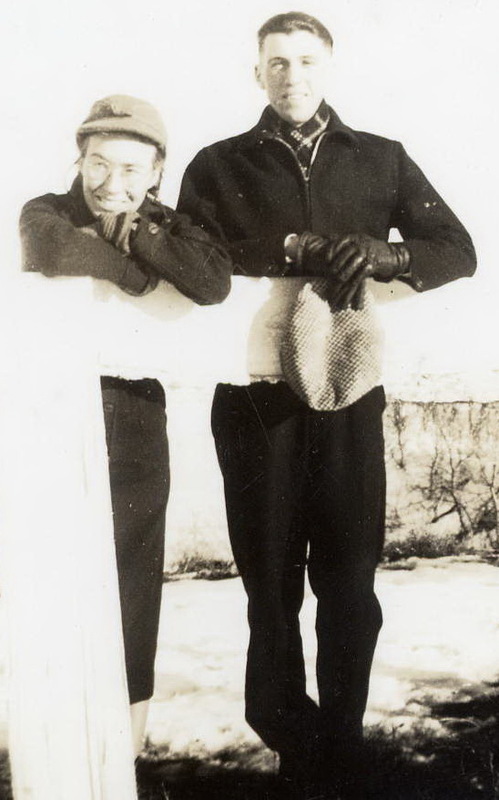 After their marriage, during the 1941-1942 period, they lived in Regina, Saskatchewan. Jean worked as a Private Duty Nurse. Tom worked at Saskatchewan Cooperative Wholesale, then attended D. P. Y. T. in preparation for Royal Canadian Air Force (RCAF) Aero-Engine Program. 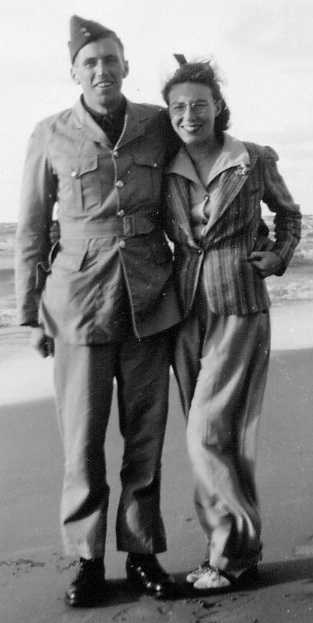 It was understood between them at the time of their marriage that it would only be a matter of time before Tom joined the Canadian military and war effort. Tom’s RCAF Training Program required that they move to eastern Canada in the summer of 1942; they remained there until February 1943. They lived in Dorval, Quebec for short time, then St. Thomas, Ontario for six months. Jean would laugh when describing their living conditions; they rented an upstairs bedroom in a two-or-three story house, the ‘kitchen’ was a single-ring hotplate on a shelf in the closet, and the bathroom was down the hall. However, they were better off than many who could not find even that type of minimal accommodation. Jean worked as First-Aid Nurse at Weatherhead’s, a munitions manufacturer of parts for ‘arsenals’. It was dangerous work with potential for serious injury for both Jean and the other employees. She told many stories of the accidental injuries she was called upon to treat, which she would treat in her compassionate while practical manner. 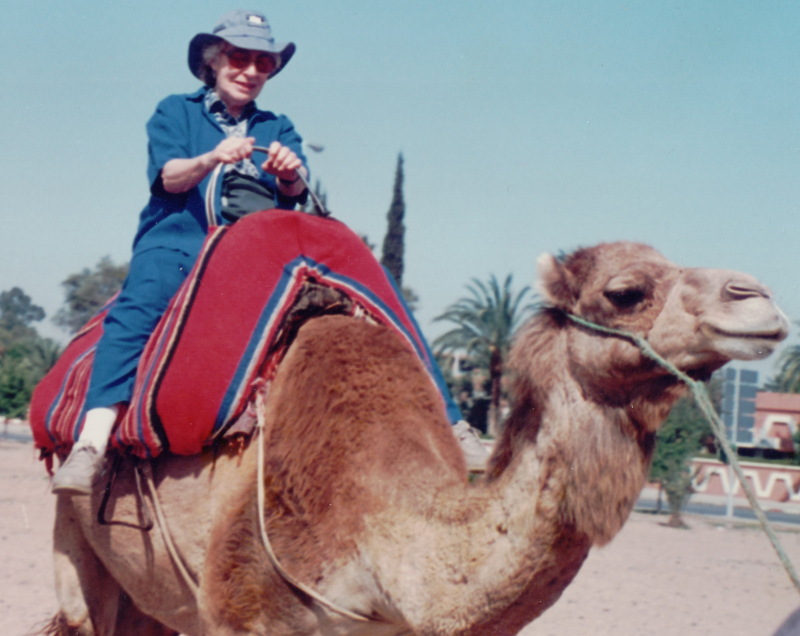 During the time they spent in Eastern Canada they travelled in the area frequently to see local sites and visit relatives; a great satisfaction to Jean’s love of travelling and new experiences. 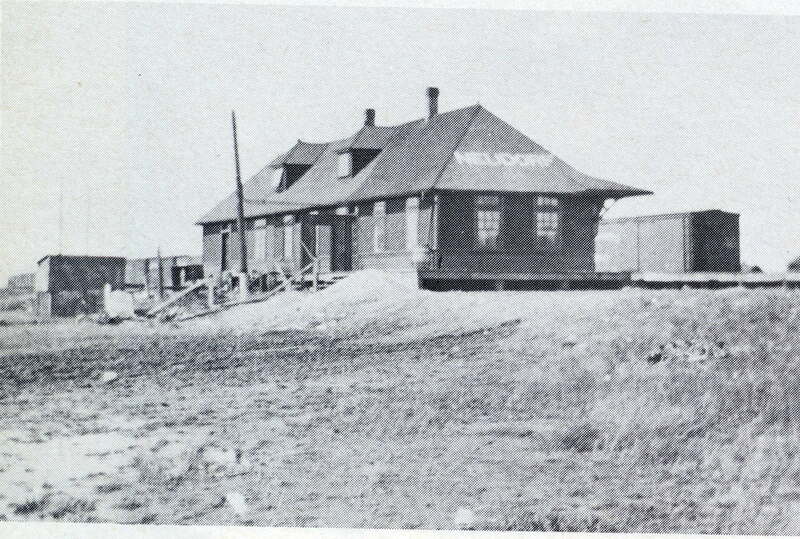 Tom’s military service required a move to Calgary, Alberta where he was stationed at #3 S.F.T.S., Currie Barracks. They lived in Calgary from February 1943 to June 1945. During this period Jean took jobs to augment the meager family income; she counted street-car passengers, substitute taught for one month at Rockyford rural school, and nursed (private duty and in a clinic). 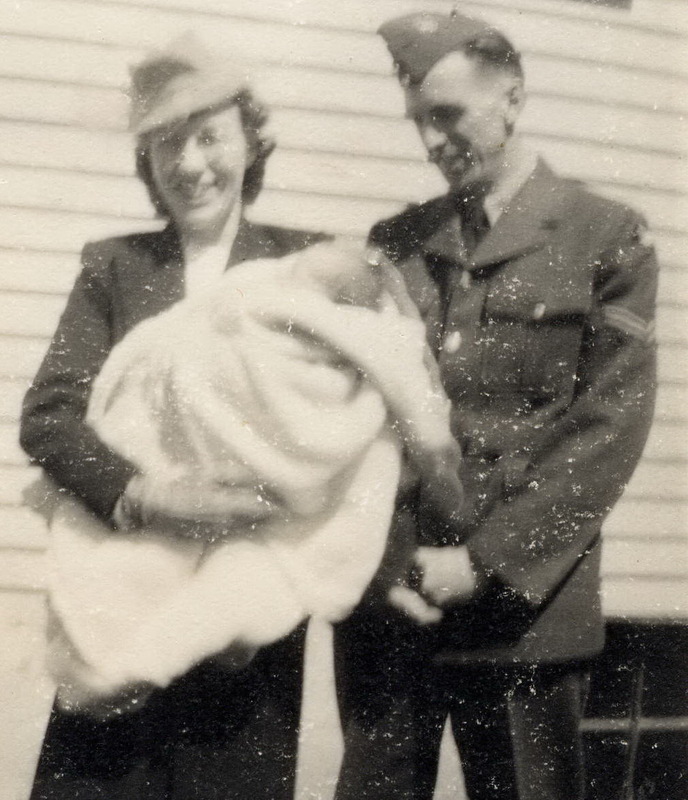 In the spring of 1945, in Calgary, Jean and Tom’s daughter Patricia was born. That summer of 1945, Jean and Tom left Calgary as Tom was posted to Penfield Ridge, New Brunswick where he was discharged in September. 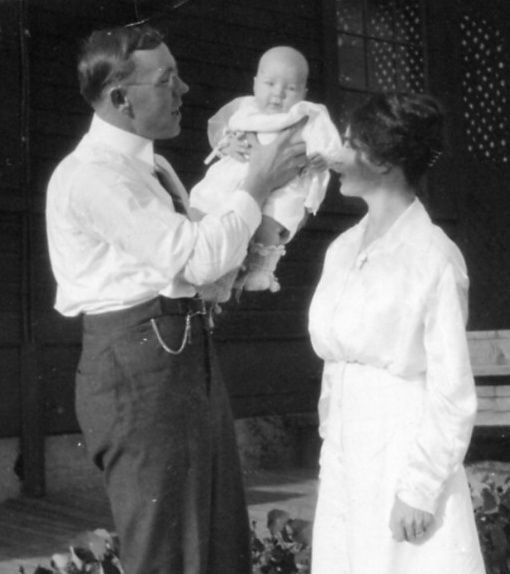 While Tom was away Jean and the baby lived with her parents the Boyces in Elkhorn and also with Tom’s parents the Actons in Lemberg on the farm. During the winter of 1945-1946 Jean and Tom lived at Regina Beach, Saskatchewan. Very little housing was available for returning veterans and their families; the three members of the Acton family spent that winter in an un-winterized summer cottage. Fortunately it was not a cold winter. 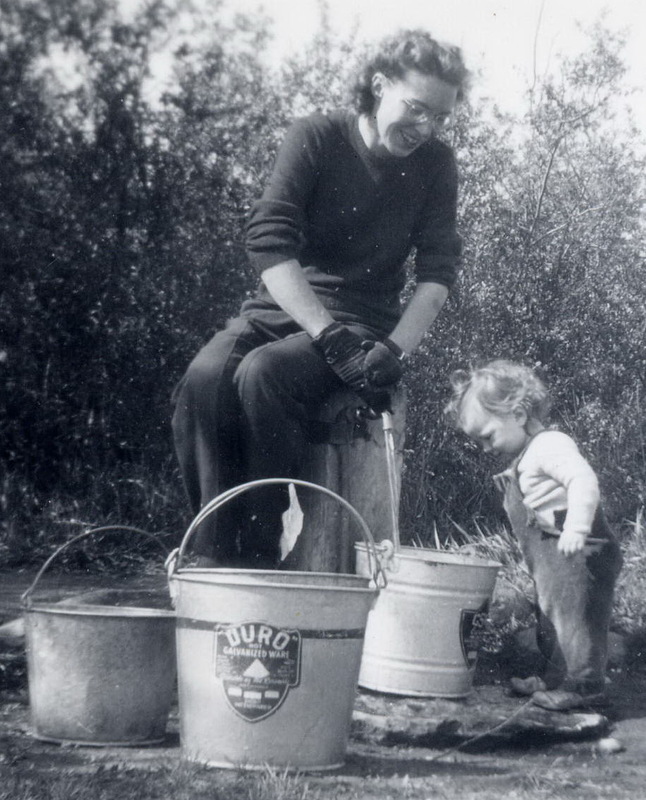 Above: Jean and her daughter pumping water while living in the emergency housing unit in Regina (aka ‘the cottage’). 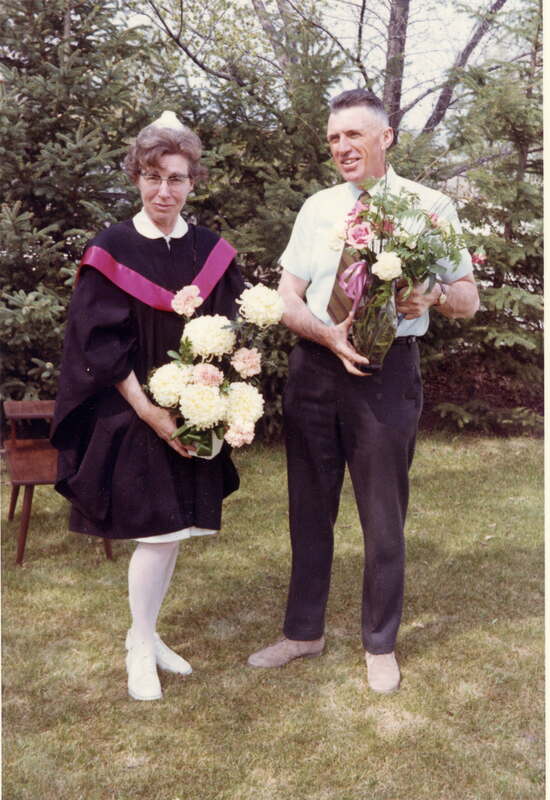 In March 1947 Jean and Tom moved to Southview Farm, the farm where Tom had grown up in the Rosewood School District (where Jean had taught), a short distance south of Lemberg, Saskatchewan. Her in-laws Nell and Joe ACTON moved from the farm into Lemberg. In the autumn of 1948 a daughter Janice was born in the in Wolseley General Hospital, Saskatchewan. Right: Tom, Jean, Patricia and baby Janice and Scotty the dog at Southview Farm with a new(?) car. Between 1947 and 1956 Jean immersed herself in the role of a farm housewife; raising her family, growing a large garden, preserving enough food for the winter months (pickling / canning / freezing fruits and vegetables, killing and gutting chickens), helping with farm chores and fall harvest and becoming involved in local community events and organizations. Occasionally there were ‘quilting bees’ when a dozen neighbour women would gather to stitch an unfinished quilt on a wooden frame that took all the available space in the living room. The Acton farm, with its neatly tended lawns, was a frequent gathering place for Sunday picnics after the service at Rosewood United Church. Mothers would ‘bring a plate’ of food and admire the garden, fathers would head to the barn to talk about weather, crops and cattle (and have a wee nip out of a bottle? ), and children would play cops and robbers (with pretend guns) and other games now considered politically incorrect. In the 1950s, Jean and Tom began to make changes in their life to enable Tom to pursue his dream of a higher education. It was a difficult process at his time because he was deeply rooted to the land that his father had broken and set to crops. But, at the same time, conditions on the farm at this time were difficult and they both realized that changes would have to be made. 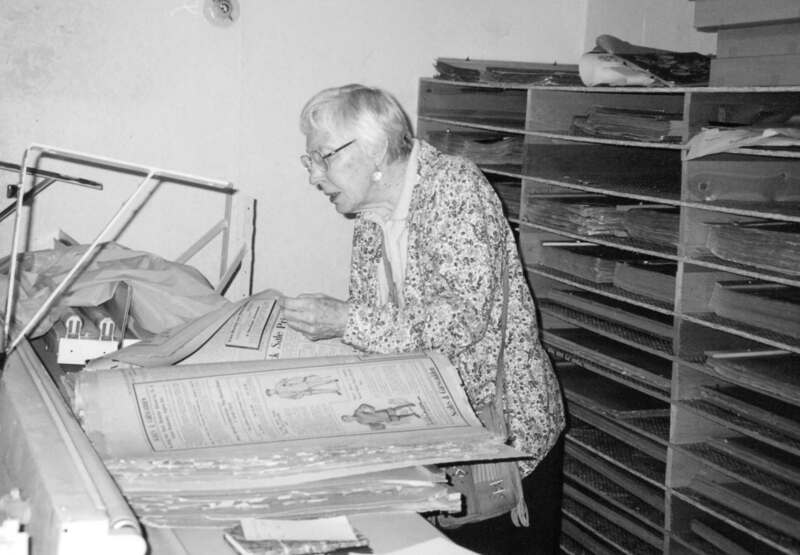 In the mid 1950s Jean responded to an advertisement in the newspaper and was hired a public health nurse for the newly created Yorkton-Melville Health District. 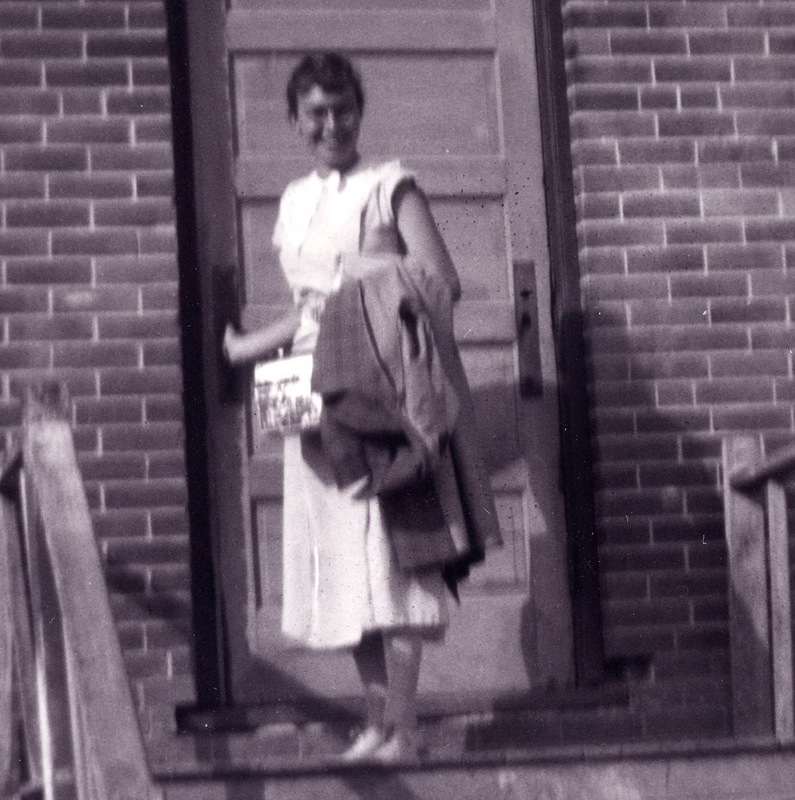 From 1956 until 1962 when the family moved to Saskatoon in 1962, Jean worked as a public health nurse in a large rural catchment area, organizing polio immunization clinics, setting up ‘Well Baby’ clinics, visiting rural and town schools and doing home visits with isolated families. Her training as a nurse, plus her own experience as a farm wife and mother, along with her openness, energy and interest in people and compassion made this an ideal job. 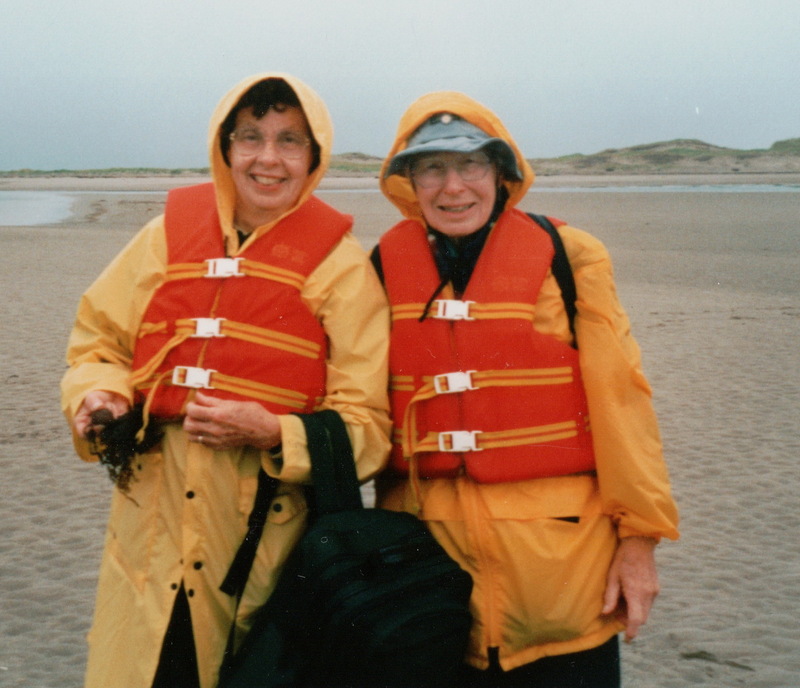 In later years she looked back on these public health years as very happy and rewarding ones, because she felt she was able to make a difference in people’s lives in many practical and concrete ways. From 1962 to 1972 Jean and Tom were in Saskatoon, Saskatchewan. Jean transferred from Public Health to Education where she taught nursing, anatomy and physiology in Nursing Assistants Program at Kelsey Institute. She enrolled in the University of Saskatchewan and obtained a Bachelor of Science in Nursing (B.Sc. N.) in 1969, then Diploma in Adult Education. Tom graduated from University with his Agriculture degree in 1965, worked part-time, then full-time at the University of Saskatchewan, then with the Saskatchewan Department of Agriculture. These difficult but important years were the crucible out of which Jean and Tom developed the idea of creating a bursary to support mature adults such as themselves wanting to improve their education. From 1972 to 1979 they lived in Regina, Saskatchewan. Jean was Supervisor of the Nursing Assistant Program (Core Year Nursing Program), Wascana Institute of Applied Arts and Science. Tom worked with the Saskatchewan Department of Agriculture. Adult Education / Lifelong Learning: In addition to advancing their formal education, throughout the ‘70s and ‘80s , Jean and Tom participated in a wide variety of adult education and university extension programs. Both were influenced by, among other adult educators, Per Stensland from Sweden, who had gained international prominence for his expertise in community medicine, community development, educational sociology, nursing education, and teaching strategies. 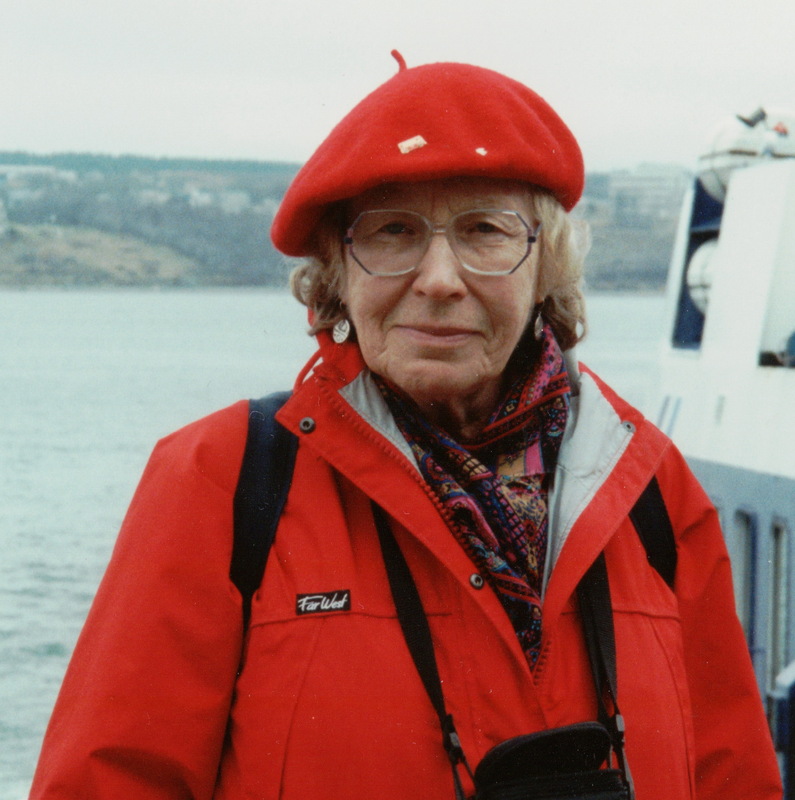 In 1976 Jean travelled to Scotland and Sweden for a program on Community Health Education offered by the University Extension Division, facilitated by Per Stensland, which provided her with a rich learning experience which clinched her lifelong commitment to adult education – and also whetted her appetite for more travel. 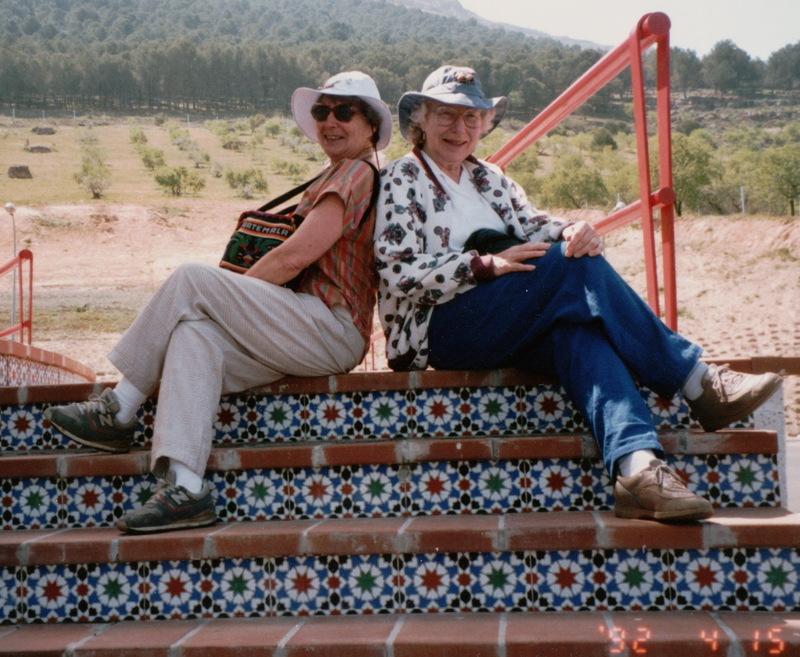 In fact, for Jean, “travel” was synonymous with “learning”. In 1979 after 20 years as Saskatchewan Government employee Jean retired, however she did not slow down. From 1979 to 1985 they continued to live in Regina (Tom was still working). Jean took classes in Research and Gerontology from the University of Regina, and conducted Retirement Planning, and other Adult Education Programs and workshops. She also did volunteer work with health and community-planning agencies. Tom retired in 1982. In 1986 they moved to Victoria, British Columbia. 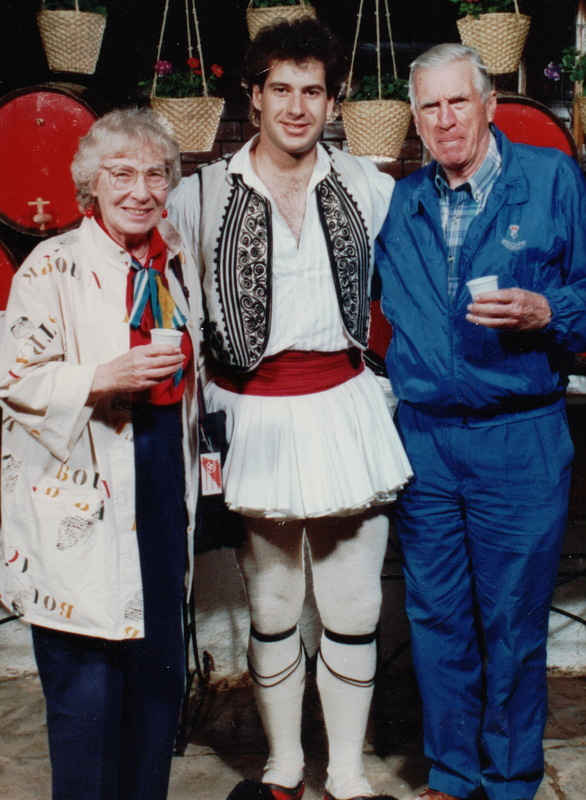 By the time of Tom’s death in 1991, Jean had been “bitten” by the travel bug, and she continued to take every opportunity possible to travel. 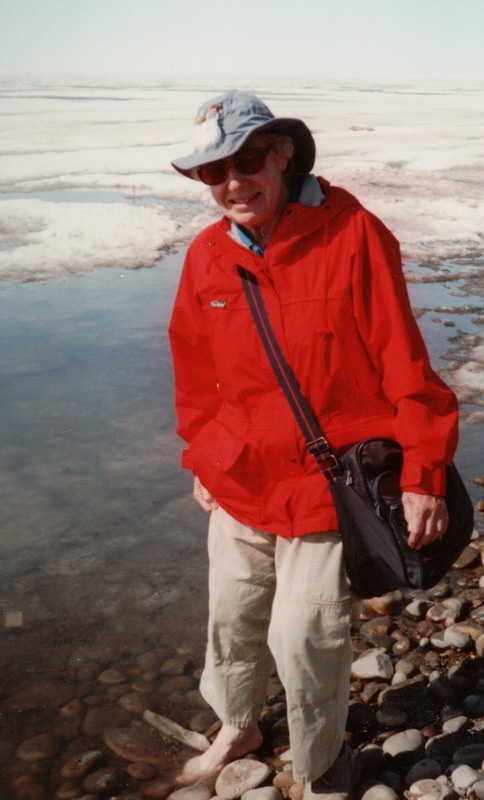 She took a number of trips on her own through the Elder Hostel Program [a program with an adult education emphasis on learning about local history and cultures] including to northern BC, the Canadian Arctic, Northwest Territories, Denmark, New York and Ontario. She was joined by various members of her family and friends as they travelled to Australia and New Zealand, Portugal, Spain, the Mediterranean, the US, and the Maritimes. Below left: Jean dipping her bare foot into the Arctic Ocean, below right: Jean and her constant travel companion – her red gortex jacket. Her habit of wearing this jacket on every trip for a period of about 20 years was a source of teasing as we never could date the photograph of the trip by her clothes. Writing: Throughout her life Jean was a prolific correspondent and regular diarist. After Tom’s death she turned a new page in her life by becoming a serious writer. She had always been attentive to details of family history and had for years been the brunt of friendly jesting because of the “little red book” she carried with her everywhere, noting births and deaths, marriages, and names of people – information that we realized subsequently was a veritable treasure. She was initially inspired to write because of her desire to learn more about her mother’s time living in Victoria in 1907-08. Her research into turn-of-the century Victoria and family memoires and papers, brought to Susan’s life and her relationship to her family, alive appeared as the book Dear May: A Conversation That Never Ended (1999). Above: Jean celebrating the printing of Frail Hands at the Helm. 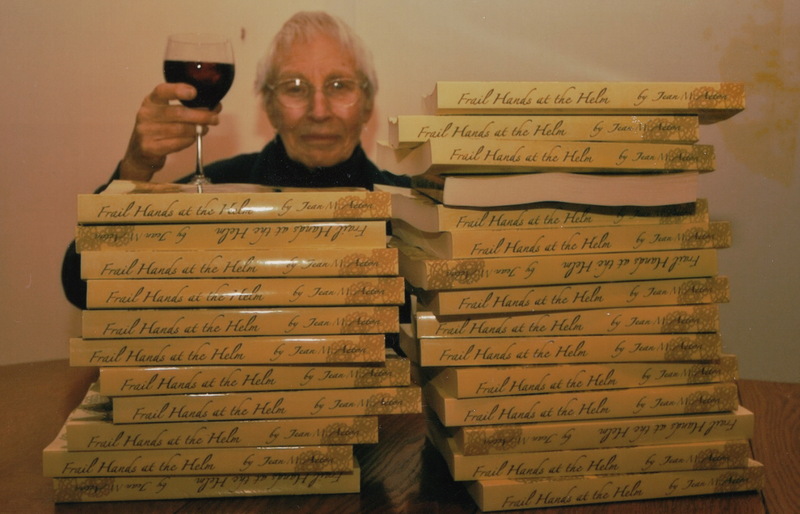 The book Dear May was followed by a more ambitious book about the life of her grandmother, Martha Dodds, and her family (Frail Hands at the Helm; 2006). Involving family members through their recollections and papers, and her own research in the Winnipeg Archives and dusty basements of the old newspaper in Virden, Manitoba, she again brought to life the powerful story of a family that had overcome great odds. In 2009, at family’s urging Jean also wrote a delightful story, Our Travelling Tabby Cat (2009), which was based upon her memory of their old pet cat who lived at her home in the Neudorf train station. Jean wrote each book in a collaborative way, involving siblings and cousins and children, knowing that each person remembers what happened in a slightly different way. One of the main themes of all Jean’s writing was the importance of family, being together, support each other, because with this support it was possible to overcome life’s problems and unhappiness. Jean embraced writing with enjoyment and passion, motivated by the desire to learn more herself and her own family, but also hoping that her efforts would help to build a bridge of understanding with younger members of the family, whose realities are so divorced from those living in the late 1800s. 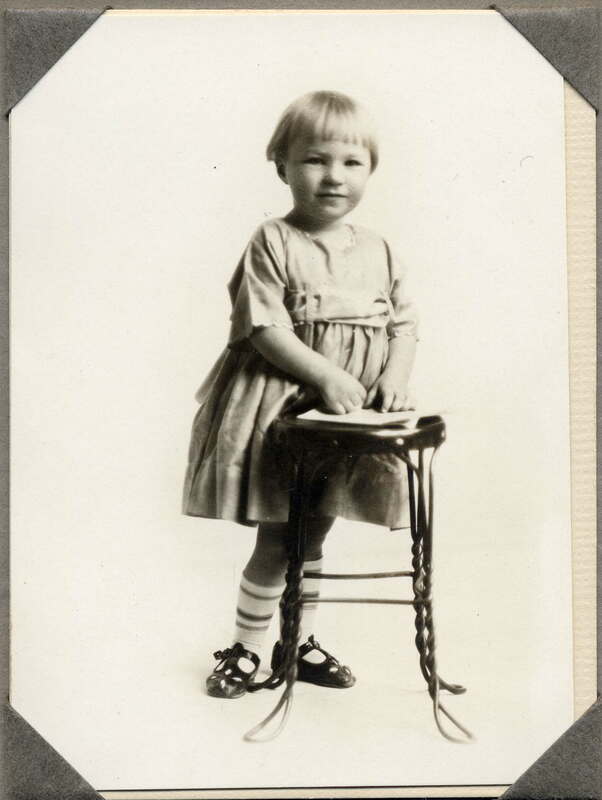 In her role as memory-keeper and family chronicler, Jean left a rich legacy of family stories, with insights and knowledge about what happened with long-gone members of the family, that will enrich the lives of the younger generation of the family. The last 7 years: In the last few years of her life Jean’s health declined. However, regardless of these setbacks, and despite her shrinking world, she never lost her graciousness, her interest in people, and her sense of the importance of family. She began a third book about family history focusing on her memories of growing up in a prairie train station. As with her previous efforts, she frequently consulted with family to affirm she was on the right path. Despite increased difficulties, Jean never lost her keen desire to engage with the world and the people around her. Until the end, Jean’s essence of empathy, love, graciousness and inner strength continued to shine. Thank you so much for your words and your stories. Getting to know both your husband and your mother through your blog was a pleasure. Thanks Flo – nice to know someone reads the stories. It looks like you are in Saskatchewan? My old home province.